It’s not news that “the degree” is losing ground as the sole signal of labor market readiness. While the degree used to serve as the exclusive and ultimate signal of employability (among other things), employers are increasingly skeptical of its value. A well-cited 2014 survey found that while 96% of provosts believe they were preparing students for success in the workforce only 11% of employers agreed. And this is all in addition to the explosion in the number of middle-skill jobs, which require some postsecondary learning but no degree (as discussed by Burning Glass’s Matt Sigelman in this EvoLLLution interview). This isn’t to say degrees themselves lack value. But employers are looking for more—a better sense of what a student has actually accomplished and a clearer sense of their skills—which means students are looking for new ways of sharing that information. The biggest flaw with traditional degrees is that they hold meaning for the institution involved, but they’re relatively opaque to outsiders. Even the presumably simple task of credit transfer requires time and effort from staff at both institutions to determine the relative value of different courses. The transcript provides a list of course codes that are unintelligible, and students and employers both are forced to ascribe meaning and value to an array of letters and disciplines without much evidence to back it all up. Of course, overcoming this obstacle doesn’t require a wholesale shift in the way universities operate. It just requires them to find new and better ways to understand and communicate student outcomes. This is where the expertise and experience of CE divisions can make a huge difference for the whole campus. Non-traditional divisions have a huge amount of experience leveraging non-credit credentials to help individuals get the relevant skills and paperwork they need to enter and advance through lucrative careers. This has historically been done on the periphery of the college, but with more openness from the main campus access to these critical microcredentials could be opened up to all learners within an institution. Employers get students trained to their specifications. Another approach CE divisions are currently taking to ensure main campus students enter the workforce with relevant skills is post-baccalaureate credentialing. These “post-bac” certificates create opportunities for recent graduates to enroll in a non-credit program designed to help them build the technical skills base necessary to stand out in a ferocious and crowded labor market. The second obstacle to overcome is in ensuring credentials clearly communicate their meaning and value. As I mentioned earlier: a transcript is about as clear as mud to the average employer, and while degrees once signaled broad competency their influence is waning as well. This is a disservice to the institution, the student and employers alike. But non-traditional divisions have been working for years to issue credentials that clearly communicate what a graduate is able to do, and have been pioneering innovative credentialing models—like badging and digital credentials—that provide even more clarity. He goes on to explain that in the information embedded within a digital badge, institutions can include critical clues that contextualize the credential—program length, work involved, intended outcomes, etc—all of which help employers understand what a prospective hire brings to the table and helps students more clearly communicate their achievements. Where we go from here, I believe, is a postsecondary ecosystem that’s designed more closely around the needs of modern students and employers. This shift will be characterized by greater recognition of student learning and more relevant credentials being issued alongside degrees. This is a really important idea worthy of deep consideration. Students don’t magically transform into a “graduate” at the end of a four-year degree program, like a butterfly leaving a cocoon. Their skills and knowledge don’t exist as a 0/1 binary, where they suddenly become competent after walking across the stage. But today’s degree model operates as though this is the case. With the tools now at their disposal, institutions should be modifying existing degree programs—and building new ones—that are stackable and have well-selected industry credentials embedded into them. This way, as a student progresses through a program at their own pace. “There is a chance for these kinds of alternative credentialing schemes to add value to existing degrees, rather than replace them,” wrote Rich DeMillo, Director of Georgia Tech’s C21CU, in The EvoLLLution. Non-traditional divisions can and should be leaned upon by main campus leaders to provide insights into the kinds of skills and credentials employers need, and then to provide support in building non-credit credentials into programming. This broadening of access—and expansion of credentialing—will benefit students, employers and the institution alike. Beyond that, this transition will require a massive ego check from those who believe higher ed is perfect the way it is. Because it’s not. 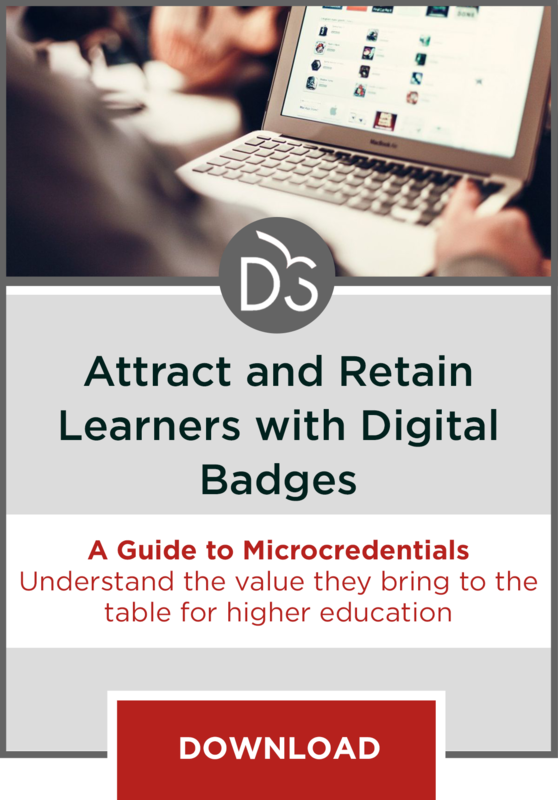 Download this Primer to better understand the value digital badges can bring to the table for your institution: Attract and Retain Learners with Digital Badges.